Vytorin is a combination of ezetimibe (Zetia) and the "statin" simvastatin (Zocor) and is used to lower cholesterol. The ezetimibe component blocks absorption of cholesterol from the intestines. Simvastatin inhibits the enzyme HMG-CoA reductase which is needed for the production of cholesterol in the liver. The combination of both medications lowers cholesterol better than either one alone. Increasing HDL cholesterol (good cholesterol). Supplied as Vytorin 10/10, 10/20, 10/40, and 10/80 mg tablets. The dosage is 10/10 mg to 10/40 mg administered orally once daily in the evening with or with out food. Because of the risk of muscle toxicity the 10/80 mg dose is restricted to patients already taking this dose for 12 months or more without developing muscle toxicity. Common: Nausea, vomiting, diarrhea, abdominal pain, headache, muscle pain, and abnormal liver tests. Statins have been associated with increased blood glucose levels, increased risk of diabetes, and memory loss. For prescription assistance for Vytorin visit Merck Patient Assistance Program. 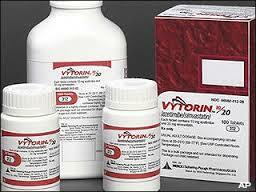 References: Vytorin FDA Prescribing Information (PI) and Medication Guide.